Detailed measurements are required to place an order. Please provide appropriate measurements below. Please refer to our Sizing Guides page for detailed instructions. Please call or email your measurements to ensure proper fit. For riders that require custom sizing please call 1-800-777-6499 or email motoportusa@earthlink.net. To ensure proper sizing Motoport needs: Height / Weight / Sleeve (from center at base of neck around outside of arms to bend in wrist). To give us the most accurate sleeve measurement, follow the Dress Shirt Sleeve instructions below. Actual Chest / Actual Waist. (No jacket or pant sizes. )Do not inhale when measuring chest. Waist should be measured where you tighten the belt. All measurements taken in a relaxed position. Tape measure should also be comfortable, not tight or loose.NOTE:If ordering Aero-Tex liner we need a neck circumferance measurement at collar height or 2″ from the base of your neck. Measuring a motorcycle jacket alone is not good. Please help to confirm the proper sleeve length by measuring a Dress Shirt Sleeve length as shown below. Also make sure to mention when providing this measurement, that this is a dress shirt sleeve length not a jacket sleeve length measurement, measured as shown in Sizing Detail. Note: Your dress shirt sleeve measured as shown above should be approximately 2″ shorter than the jacket sleeve length measured. After we receive the above measurements, we will advise if any other measurements are necessary. • Double layers of leather on back of fingers with Carbon Fiber inserts. Extra layers of leather in the thumb forefinger and index finger. 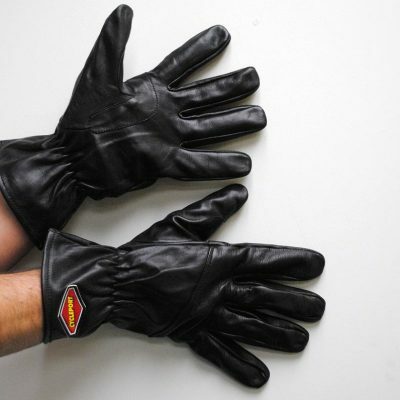 • Thin inner lining only on top of fingers and hand to provide the ultimate in feel and control when gripping the bars. • Multiple leather stretch panels to provide comfort even with the extensive coverage of Carbon Fiber. Place the order on our web site or give us a call. 800-777-6499 for USA and Canada. Or call 760-752-1048.